Unexpected pep talk – Nourish your soul. Flourish your life. I love my bed time chats with my girls. It’s our chance to catch up, get questions answered and talk about life. Usually I try to give them my full attention and offer some clarity, comfort, encouragement, support, love and the kind of knowledge that their young years cannot grant them. My hope is that on some level they’ll remember and treasure this time as much as I do. But tonight I walked out feeling like maybe, I got it all wrong. I really have to listen more. Eden: I wish I would have a little sister when I’m a teenager. Me: Huh. Ok, Why’s that? Eden: So when I have a crush she can come and say “Oooh, is that your boyfriend?” and tease me in a cute way. Me: Really? You’d like that? Eden: Yup. How old do I have to be to go to high school? Eden: So it goes 1, 2, 3, 4, 5, 6, 7, 8, 9, 10, 11, 12, 13, 14. That’s it? I’m already at 5, that was pretty quick! Me: Tell me about it. Before you know it, you’ll be off to high school. Eden: 15, 16, 17, 18, 19, 20, 21…. (And then goes on steadily counting to one hundred. To be clear, I just liked hearing her thoughts on life. If I had known otherwise I may have asked her to show me how good she was at counting by tens). Eden: What?? I just counted to 100! Oh My Gosh! Are you so proud of me? Me: Absolutely! That was awesome! Eden: Wow! 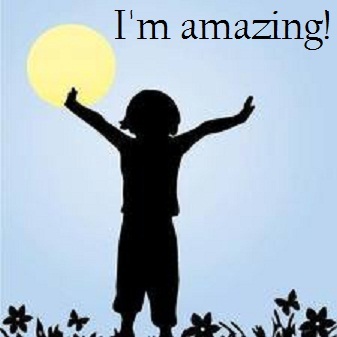 It’s like, I’m amazing!!! Me: You are. And don’t you forget it. Eden: I thought counting to 100 would take so many days, like a long, long time. See mama? When you think you can’t do something, you actually can. Parole piene di saggiezza:) Thank you.